Mainstage at Bakehouse Theatre, Wed 21 Feb. 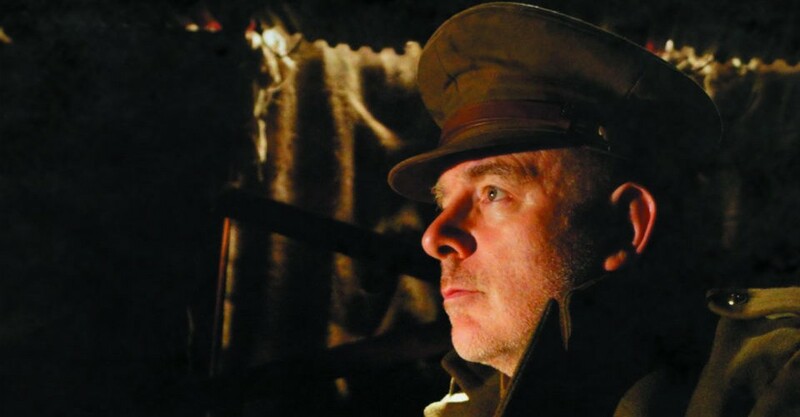 Guy Masterson steps out onto the stage and introduces this production, staged to commemorate the centenary of the final year of the Great War. ANTHEM FOR A DOOMED YOUTH is the first of four plays in the 2018 Lest We Forget series. There’s no set, no adornments at all apart from some sparse lighting and sound effects; just Masterson, dressed fittingly in black. He advises that works by the ‘superstars’ of the genre, Wilfred Owen and Siegfried Sassoon, will feature heavily, but Masterson also promises to bring us pieces from both sides of no man’s land. What follows is a rather brilliant selection of poems and stories that takes the listener from the visceral reality of bodies and lives blown apart, to the more frivolous notions one might experience in the middle of the madness of war – works such as Alfred Lichtenstein’s Prayer Before Battle. Masterson provides a little background for each piece; something that adds to the humanity of the texts. It is sometimes difficult to marry the beauty of the sentiments articulated with the absolute horror of war. He reads the only thing he could find regarding the much-mythologised 1914 Christmas Truce, before presenting his own short piece on the same topic; a light-hearted Anglo-German conversation across the trenches. Excerpts from All Quiet On The Western Front are dramatic, especially when placed alongside the unnerving yet gentle beauty of Albert-Paul Granier’s The Andante. The performance concludes with Masterson reciting Wilfred Owen’s stirring Dulce Et Decorum Est, setting the ultimate futility or war in sharp relief. Guy Masterson is a sublimely skilled performer and his heartfelt execution of these works is a testament to his talents, as well as to those of the authors. This is a most poignant and potent production. Lest We Forget. ANTHEM FOR A DOOMED YOUTH continues at Mainstage at Bakehouse Theatre from 9pm until Sat 3 Mar. A most poignant and potent production.